This .40 S&W load from Winchester features a light 165 grain full metal jacket flat nose bullet, ideal for target practice. It uses non-corrosive Boxer primers and reloadable brass casings. 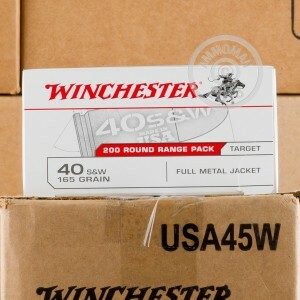 This 200 round value pack is a great choice for spending a day out at the range. The .40 S&W cartridge is a shortened version of the 10mm Auto, and was developed for law enforcement agencies that wanted a service pistol cartridge more powerful than the 9mm Parabellum without the heavy recoil of the 10mm. Manufacturers of police sidearms were easily able to adapt the more compact .40 S&W cartridge to their existing 9mm designs, resulting in a variety of popular pistols such as the Glock, Browning Hi Power, and more recently the Springfield XD and the Smith & Wesson M&P appearing in .40 S&W variants. 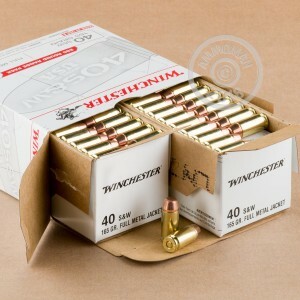 Buy more than $99 worth of ammo from AmmoMan.com and we'll throw in shipping, on the house. 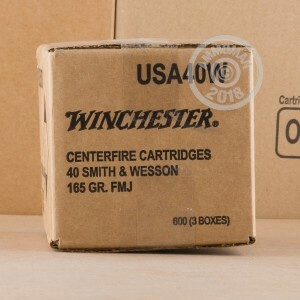 A real bargain means no shipping and handling charges to inflate the price of your ammo!